A dry Italian salami, which generally consists of equal parts of pork and beef, however it can be produced with all pork meat. It is seasoned with black pepper, garlic, spices, dry white wine, and packed into a small natural casing measuring approximately 4 to 8 inches in length (10 to 18 cm) and 1 inch (3 to 4 cm) in diameter. It is then dry aged for one month or longer. When served, it is sliced thin for use in sandwiches, as an appetizer with cheese, or as a topping for foods. 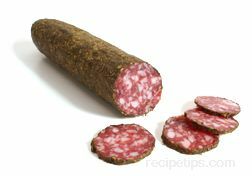 Dry sausages such as Italian Cacciatorini are commonly thought of as hunter style salami, since it is made as a small rustic salami to be carried in hunter's pockets and eaten as a lunch meal. This product may also be referred to as cacciatore (translated into hunterin Italian), cacciatoro, or salame milanese.